I want to pause playback after headphones have been unplugged, then resume after they were plugged back in. My current solution uses ACPI to detect plug / unplug, as shown here. To play / pause the playback, I use xdotool key XF86AudioPlay. headphones are plugged back in -> music continues playing. However, I do not want to resume playback if it wasn't active when the headphones were unplugged. The last point is where the problem lies – the playback would resume after the headphones are plugged back in, although it was not active at the time they were unplugged. unplug headphones (MUSIC STARTS PLAYING!). So what I need is to detect play / pause / stop events as well as plug / unplug events, to be able to correctly react in all possible scenarios. 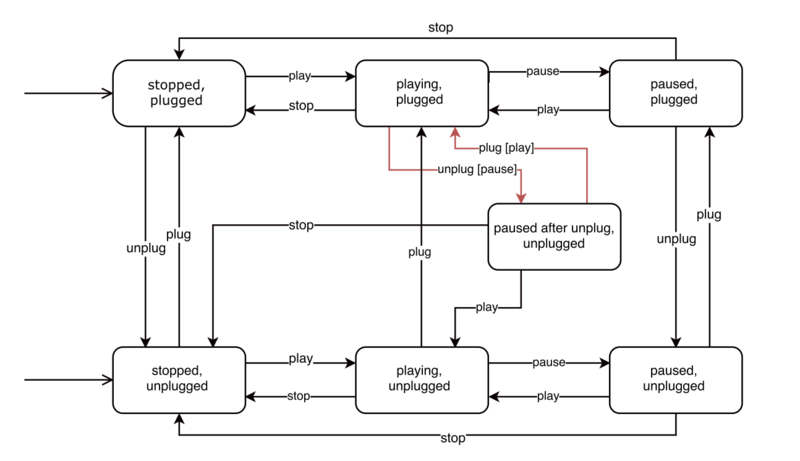 The one idea that came to my mind is to re-bind the keyboard shortcuts for play / pause / stop to add the state machine logic. This has the drawback that playback always has to be controlled using these keyboard shortcuts, instead of eg. Rhythmbox buttons, which is somewhat impractical. Also, if I close Rhythmbox while playing, the state machine will stay in a playing state. Of course I could have a 'daemon' which will wait until Rhythmbox is closed, and then set the state to stopped. But what if it's not Rhythmbox that plays the music, what if it's for example VLC, etc.? This approach is ugly and unreliable, so I would like to avoid it. My question: How to detect when media playback was paused / resumed / stopped? One option is to check the state of the Pulseaudio streams, e.g. with pacmd list-sink-inputs (look at state), or interacting directly with the Pulseaudio demon in a programming language of your choice. That requires the media player to pause the stream (change state from RUNNING to CORKED) if the player itself is paused. Some media players may do that, and some may not. Not the answer you're looking for? Browse other questions tagged audio pulseaudio events mediaplayer or ask your own question.